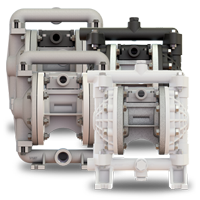 Leak-free bolted construction provides a greater positive seal with Elima-Matic® E5 1/2″ Air Operated Diaphragm Pumps. Elima-Matic’s air valve system provides the reliability you need and lets you transfer chemicals safely and confidently. Click here for E5 detailed specifications. Click here for E5 brochure.